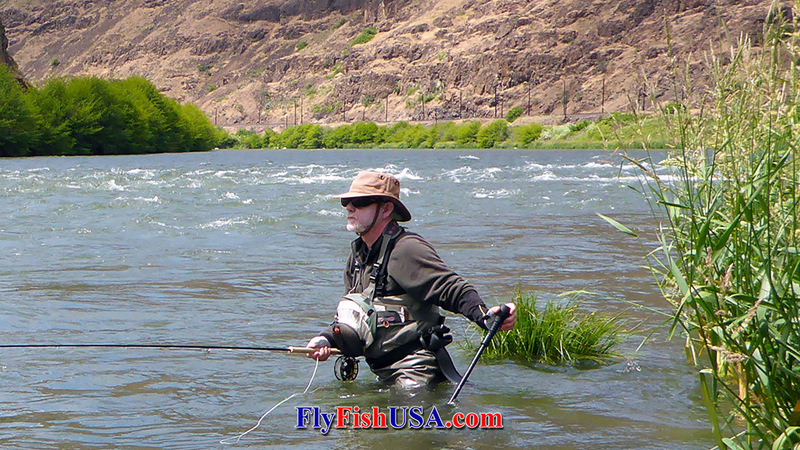 There are several components used in fly fishing that every angler must have. Certainly a rod/reel/line combo is necessary. A selection of flies and leaders are mandatory. Accessories such as fly floatant, a clipper, and a hook sharpener are also important items. If you are fly fishing while wading, chest high waders, a waterproof jacket, and the layering that goes under them are all essential to your safety and comfort. A wading staff is also a key piece of equipment if you fish certain kinds of streams with fast water and bouldery, slick bottoms. 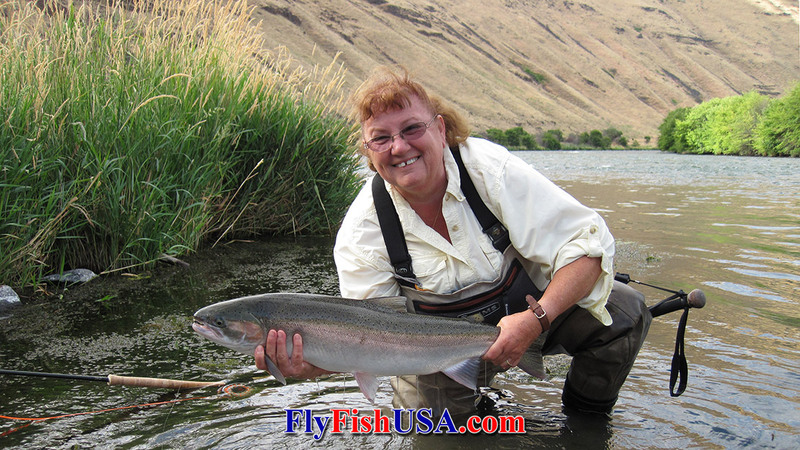 A staff becomes even more important when fishing large, fast flowing steelhead or salmon rivers. 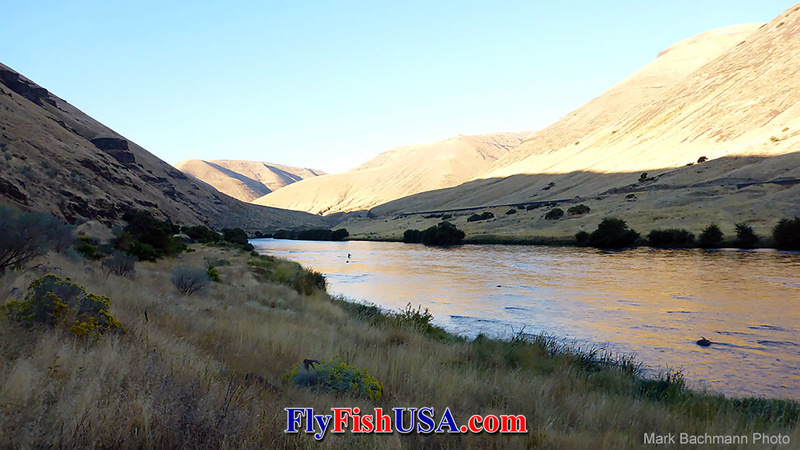 As in the picture above, an angler can feel small and isolated while wading waist deep forty yards from shore amid a river bottom covered with boulders, many of which are larger than a microwave oven. A well designed staff can help give a timid angler a sense of security, even while wading in a big river. Many different items have been adapted to become wading staffs. Ski poles, shovel handles, and beaver sticks are a few that come to mind. Tie a length of cord to a stick to act as a tether and you have a wading staff of sorts. Anything that helps you wade safe and upright is a good deal. If you fish big brawly steelhead rivers such as the Deschutes, Umpqua, or Clackamas, you will come to understand that traction devices on the bottom of your wading shoes are of prime consideration, and that no matter how strong and graceful you are, having a wading staff in close proximity can help prevent you from getting into harm's way. A wading staff can act as a third leg for balance, and it also allows you to probe ahead of you for water depth and bottom structure. But, you may also find out that your extra fly line seems to get wrapped around your staff a lot. And that a staff on the end of a tether in flowing water tends to move around, and you can spend an annoying amount of time trying to figure out whether it is now in front of or behind you. It becomes clear that a wading staff that isn't managed well can get in your way, slow you down, and even become a hazard if you trip over it. Not all wading staffs are equal. The best wading staffs were designed to be extremely portable, unobtrusive and instantly at hand when you need them. The pros and cons of wading staffs can create great debates in fishing camps, and can even cause heated arguments. My contention has always been, "If you think you need one, you do. However, if you are strong enough to fish without one, you will be able to cover water more efficiently." Fortunately, you can now have your cake and eat it too. 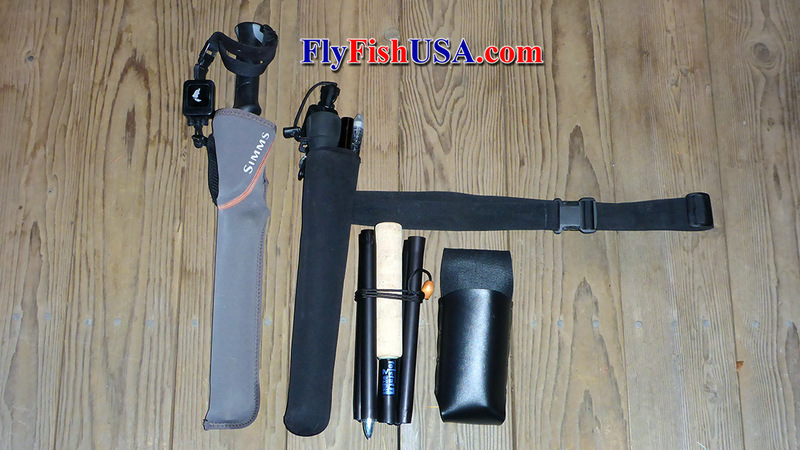 You can purchase a folding wading staff and put it in a holster that is attached to your wading belt. There are a couple of great wading staffs that can be pulled from a holster and then automatically assemble themselves and instantly become rigid and strong enough to lean on. A staff like that can restore faltering balance in mere seconds. The first popular folding, self-assembling wading staff that I remember was the Folstaf. It had been around for about ten years when we discovered them in them in 1981. It was soon followed by the Super Folstaf, which was larger in diameter and stronger. The Folstaf and Super Folstaf were revolutionary. The Super Folstaf was made from six sections of 3/4" diameter aluminum tubing approximately 10" long, which incorporated tapered ferrules and a bungee cord that ran up the inside of the tubing. There was a sharp tungsten carbide point at the bottom and a floating cork handle at the top. A tether attached to the leather holster kept the staff from floating away while you were fishing. As soon as the folded staff was removed from the leather holster the internal pressure from the bungee cord would automatically cause the staff to assemble itself into a rigid cane. The only problem was that unless you coated the ferrules with paraffin on a regular basis the tapered ferrule would stick together and become difficult to get apart unless you found a big rock to pound it against. Folstafs were and still are one of the most popular wading staffs ever produced. They have been copied many times, but rarely improved upon. Recently Simms, a massive clothing company, went a completely different route and designed a four section folding wading staff that locks together using a push-button and cable system. Each Simms Wading Staff comes with a neoprene holster that attaches to your wading belt. When the staff needs to be disassembled and returned to its holster, it comes apart easily and quickly. There are two models: #7075 and made from aluminum tubing, and the Pro made from carbon fiber tubing. Both staffs are instantly customizable for all lengths between 51' and 56". The staff construction tubing is 5/8" in diameter, slightly smaller in diameter than the Folstaf. The sheathed Simms staffs are 21" long and much smaller in diameter than a Super Folstaf. Simms wading staffs are very strong and dependable when all the parts are connected, but they are do not automatically assemble themselves when they are pulled from the holster. This can be a disadvantage if you wade into danger while the staff is still in the sheath. 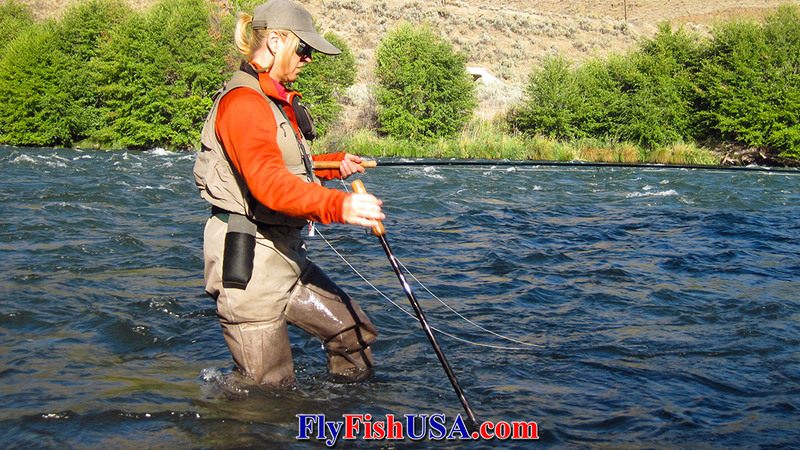 The Fly Fishing Shop Custom Wading Staff entered service in 2017. 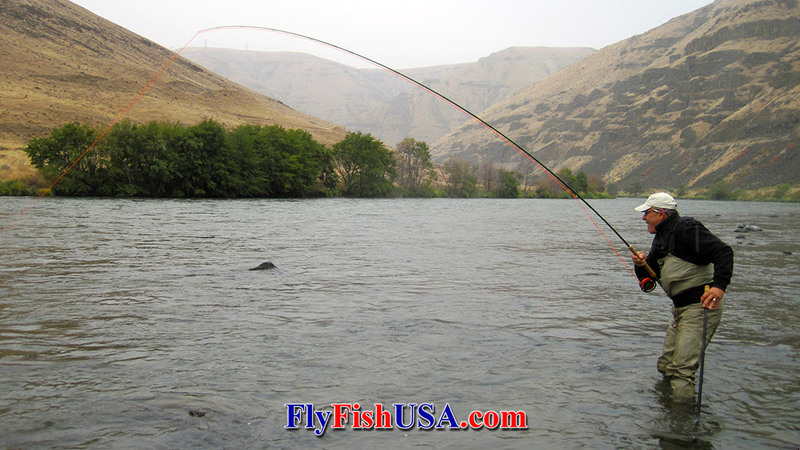 The design and construction uses all of our 36-years experience while wading big bad steelhead rivers with many other wading staffs including the two great ones mentioned above. 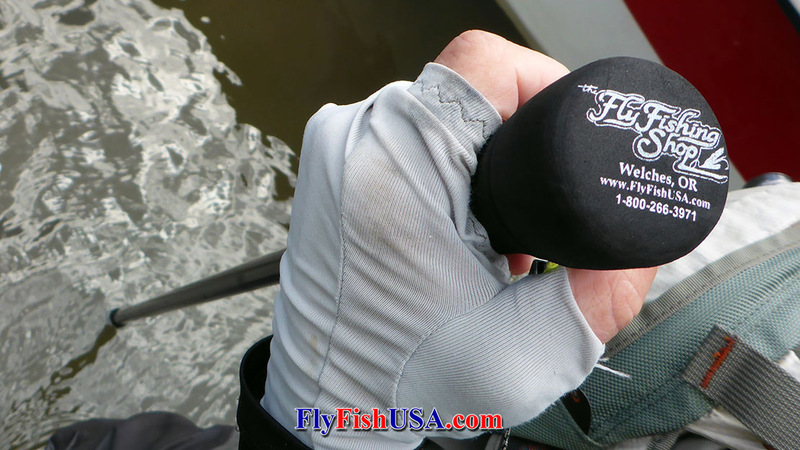 The modern 5/8" hard aircraft aluminum alloy tubing used in the Simms staff was combined with the Folstaff idea for a narrow staff that fits into a narrow streamlined neoprene sheath. It is 18" long when stored in the sheath. When you pull this staff from the sheath, it will self assemble itself to a full 55". Our wading staff uses straight instead of tapered ferrules so that it doesn't stick together when you want to take it apart. True, you may have to give it an extra wiggle for it to fully assemble. But, when you do, it is just click, click and it is as rigid as a lamp post. When combined with a Gear Keeper Wading Staff Retractor, the handle of the Custom Staff will ride against your leg or hip, and prevent your fly line coils from wrapping around it. To facilitate this, move the sheath around behind you and let the staff ride downstream in the current. The big round ball on the handle will ride against your hip. We think the Custom Wading Staff is the best staff available at the best price. In the end, which staff is best? Which wading staff is best depends on a number of criteria: which gives you the most confidence, which is most trouble free, which is more portable in your luggage, and maybe even which one you got for Christmas. You can't go wrong with any of those listed on this page. But of course, we like ours. They make a great present for anyone who wades or hikes.